SEBRING (AUS) (Chestnut 2005-Stud 2009). 5 wins at 2, STC Golden Slipper S., Gr.1. Sire of 717 rnrs, 478 wnrs, 53 SW, inc. Criterion (Australian Derby, Gr.1), Dissident, Egg Tart, Amphitrite, Lucky Bubbles, Ringerdingding, Bring Me the Maid, Sesar, Sedanzer, Gold Standard, Seaburge, She Brings Joy, Catch a Fire, Hattori Hanzo - Let Us Win (H.K. ), Believe Yourself, Ulmann, Violate, Thurlow, Master Ash, Art Series, Broadband, Miss Admiration, etc. PROGRESSIVE, by Street Cry. 4 wins to 1250m, A$94,405, ATC TAB Rewards H.-twice, 2d ATC Professor Geoff McKellar Memorial H. This is her first foal. Progressive. 4 wins. See above. Transfers. 4 wins to 1400m, A$156,500, ATC TAB Rewards H., Eastern Heart Clinic H., Tab.com.au H., Environbank Walk 4 Nathan H., 3d ATC Schweppes H.-twice. Racing Country. 2 wins at 7f, 1m in 2018, Ascot Savills H.
MURJANA (Giant's Causeway). Winner at 2, SAJC Breeders' S., Gr.3, 3d VRC Michael & Goldie Mazur H. Producer. Nkuni. 4 wins from 1400m to 2150m, AJC Les Eldridge H., STC To Russia With Gloves H., 2d AJC Gunsynd Welter H., 3d AJC Marriott Hotels Australia H., STC Gow-Gates Financial Services H.
I'll Fly Away. 3 wins from 1400m to 2050m, MVRC Happy 70th Errol Perera H., 4th BRC Wayne Wilson P., L.
GATHERING (Tale of the Cat). 4 wins from 1400m to 1600m, A$995,775, WATC Railway S., Gr.1, VRC Paris Lane S., L, AJC Shamekha H., NSW Tatt's RC Sydney City Toyota H., 2d AJC Spring Champion S., Gr.1, STC Gloaming S., Gr.3, 3d VRC Sires' Produce S., Gr.2, MRC Norman Robinson S., Gr.3, 4th STC Tulloch S., Gr.2. Villa Carlotta (Street Cry). Winner at 2, A$96,000, ATC Staff Recognition Day 2YO H., 2d ATC Bowermans Furniture H., 3d ATC Reisling S., Gr.2, 4th ATC Percy Sykes S., Gr.2. CALIFORNIA TURBO (Fastnet Rock). 3 wins at 1300m, 1400m, A$167,055, HK$303,600, in 2017-18, ATC South Pacific Classic, L, 2d HKJC Designs on Rome H., 3d BRC Rough Habit P., Gr.3. Warranty (All Too Hard). 3 wins to 1400m, A$205,580, in 2017-18, ATC Exosphere Standing at Darley H., Cellarbrations H., 2d ATC Winning Edge Merchandise H., 3d VRC Lexus Hybrid P., L, BRC Nudgee S., L, 4th ATC Nivison S., Gr.3. Movin' Out. Winner. See above. NIAGARA (Encosta de Lago). 2 wins at 1500m, 1550m, A$238,580, ATC Ajax S., Gr.2, Teachers Eyecare H., 2d MRC Sandown Guineas, Gr.2, ATC Eskimo Prince H., L, Tyreel Stud 2YO H., 3d MRC Norman Robinson S., Gr.3. Sire. UMATILLA (Miswaki). 7 wins-3 at 2-to 1200m, A$683,305, WATC Karrakatta P., Gr.1, VRC Hilton on the Park S., Gr.3, SAJC Da Costa P., L, 2d VRC Lightning S., Gr.1, VATC Blue Diamond S., Gr.1, SAJC Breeders' S., Gr.2, STC Pago Pago S., Gr.2, SAJC National S., Gr.3, DC McKay S., Gr.3, MVRC Stanley Wootton S., Gr.3, VATC Rubiton S., Gr.3, South Australian S., Gr.3, 3d VRC Newmarket H., Gr.1, Sires' Produce S., Gr.1. Sire. HURRICANE SKY (Star Watch). Second on The 1994-95 Australasian 3YO Classification (1000m - 1400m).Third top colt on The 1993-94 Australasian 2YO Classification. 6 wins-3 at 2-from 1100m to 1800m, A$876,650, AJC All Aged S., Gr.1, VATC Blue Diamond S., Gr.1, Autumn Classic, Gr.2, VRC Criterion H., L, VATC Zeditave S., L, Street Cafe 2YO H., 2d Australian Guineas, Gr.1, VATC CF Orr S., Gr.1, 3d VRC Mollison H., L, VATC HDF McNeil S., L, VRC Food & Wine Festival H., 4th MVRC Alister Clark S., Gr.2. Sire. RULING DYNASTY (Medaglia d'Oro). 6 wins from 1600m to 2400m, A$367,035, to 2017-18, City Tattersalls Club Cup, L, 2d BRC Brisbane H., L.
EVER THE SAME (Canny Lad). 3 wins at 1200m, 1300m, A$147,900, ATC PJ Bell S., L, 3d ATC Darby Munro S., L.
AL MAHER (Danehill). 5 wins-2 at 2-from 1200m to 1800m, A$1,168,300, VRC Australian Guineas, Gr.1, STC Gloaming S., Gr.2, VRC Carbine Club S., Gr.3, AJC Clipsal 2YO P., 2d STC Phar Lap S., Gr.2, Tooheys New 3YO Golden Rose, 3d MRC Sandown Guineas, Gr.2, 4th AJC Spring Champion S., Gr.1. Sire. BIG TIME (Danewin). 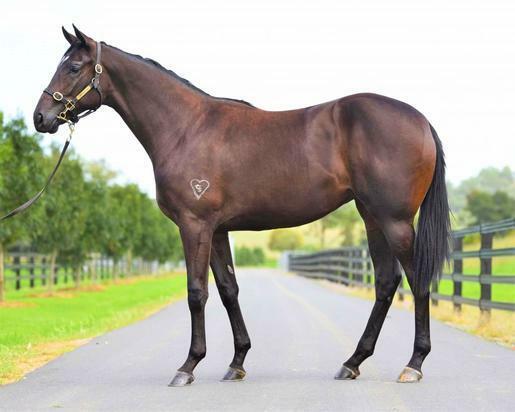 4 wins from 1600m to 1900m, A$149,625, ATC Dulcify H., L, Trackside Markets H.
TROJAN HARBOUR (Harbour Watch). 2 wins at 2, R171,935, Greyville Gatecrasher S., L.
PLATINUM SCISSORS (Danehill). 5 wins from 1400m to 2000m, A$982,800, AJC Spring Champion S., Gr.1, MRC Norman Robinson S., Gr.2, GCTC AD Hollindale S., Gr.2, Newcastle JC Newmarket H., L, AJC Eastlakes H., 2d BTC Doomben Cup, Gr.1, NSW Tatt's RC Chelmsford S., Gr.2-twice, STC Tulloch S., Gr.2, Hill S., Gr.2, Gloaming S., Gr.2, BTC Labour Day Cup, Gr.3, 4th AJC George Main S., Gr.1. Sire. REDOUTE'S CHOICE (Danehill). Champion 3YO Miler in Australia in 1999-2000. Joint Champion 3YO in Aust/NZ in 1999-2000. 5 wins-2 at 2-from 1100m to 1600m, A$1,567,850, VATC Blue Diamond S., Gr.1, Caulfield Guineas, Gr.1, CF Orr S., Gr.1, MVRC Manikato S., Gr.1, VATC Veuve Clicquot S., L, 2d MVRC Australia S., Gr.1, 3d VATC Futurity S., Gr.1, Vic Health Cup, Gr.1, 4th VRC Ascot Vale S., Gr.2. Champion sire. MANHATTAN RAIN (Encosta de Lago). Joint second on 2008-09 Australasian 2YO Classification. 2 wins at 2, A$1,311,200, AJC Sires Produce S., Gr.1, Skyline S., Gr.3, 2d MVRC WS Cox P., Gr.1, AJC Canonbury S., L, STC Theslipper.com.au 2YO H., 3d STC Golden Slipper S., Gr.1, AJC Champagne S., Gr.1, MRC Caulfield Guineas, Gr.1, Caulfield Guineas Prelude, Gr.3. Sire. RUBICK (Encosta de Lago). 3 wins-2 at 2-at 1000m, 1100m, A$379,500, MRC Schillaci S., Gr.2, Blue Diamond Prelude (c&g), Gr.3, ATC TAB Iphone App 2YO P., 3d ATC Challenge S., Gr.2, 4th MRC Blue Diamond S., Gr.1. Sire. ECHOES OF HEAVEN (Encosta de Lago). 3 wins-1 at 2-from 1400m to 1800m, A$154,725, SAJC Port Adelaide Guineas, L, 2d South Australian Derby, Gr.1. Sire. PRECIOUS LORRAINE (Encosta de Lago). 3 wins-2 at 2-at 1600m, 2400m, A$247,750, South Australia Fillies Classic, Gr.3, VRC Gibson Carmichael S., L, SAJC Oaklands P., L, 4th MVRC AAMI Vase, Gr.2. Producer. LUCKY RAQUIE (Encosta de Lago). Winner at 2, A$205,650, Canberra RC Black Opal S., L, 3d ATC Gimcrack S., L.
SHOALS (Fastnet Rock). Equal Leading Older Female on the 2018 WTR (Sprint). Champion 3YO Filly in Australia in 2017-18. 7 wins-3 at 2-from 1100m to 1600m, A$2,535,270, to 2017-18, VRC Myer Classic, Gr.1, ATC Surround S., Gr.1, SAJC Sangster S., Gr.1, ATC Percy Sykes S., Gr.2, VRC Thoroughbred Breeders S., Gr.3, MVRC Atlantic Jewel S., L, 2d ATC Canterbury S., Gr.1, MRC Thousand Guineas, Gr.1, ATC Premiere S., Gr.2, MRC Thousand Guineas Prelude, Gr.2, 3d MVRC Ian McEwen S., Gr.2. SUMMER SHAM (Not a Single Doubt). 3 wins to 1400m, A$192,550, in 2017-18, MRC Angus Armanasco S., Gr.2, MVRC Independent Turf Services H.